We currently have a total of 13 weaners for sale from our 2 pedigree Tamworths. These are good hardy stock and they are quite happy to live outside in the woods all year round. If you want to help support rare breeds and also would like some great home-grown pork for your freezer then these come highly recommended. The 1st sow farrowed on 25 February and the litter consists of 2 gilts & 3 castrated boars. 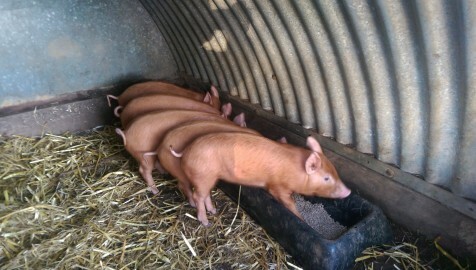 At the moment they are all outdoors with the sow and will be available around 21 April. 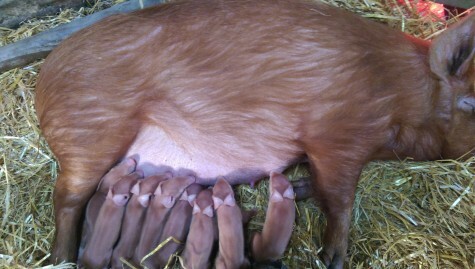 The 2nd sow farrowed on 21 March and the 3 gilts & 5 castrated boars will be available around mid May. They are currently still inside and will be moved outside when they are around 2 or 3 weeks old.